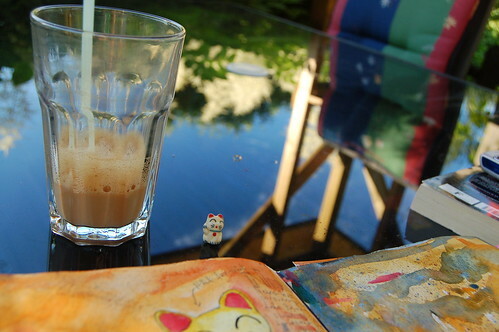 Sitting in the shade with my Art Journal and a high glass of iced coffee. 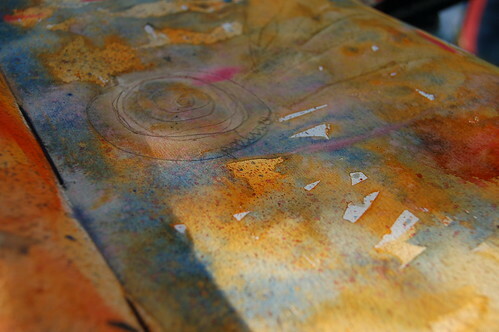 Dipping my paintbrush in water and painting with a mostly unused colour (ochre) in my paint box of watercolours. Swirling it around, making pools of water. 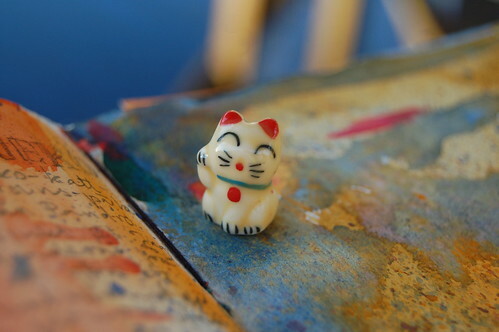 Studying a tiny porcelain bead I found in the craft shop recently. 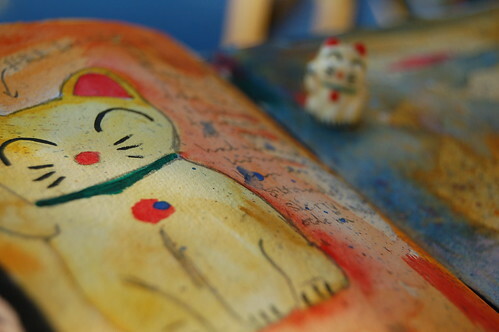 It is the Neko cat. I’ve always thought they are cute. 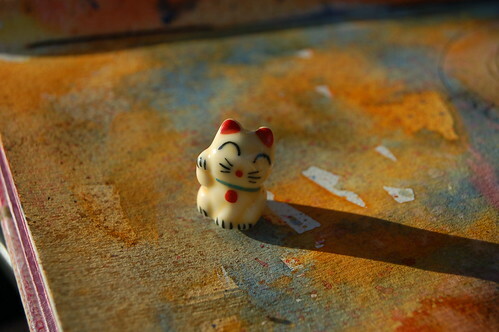 The Maneki Neko (招き猫?, literally “Beckoning Cat”) is a common Japanese sculpture, often made of ceramic, which is believed to bring good luck to the owner. The sculpture depicts a cat beckoning with an upright paw. 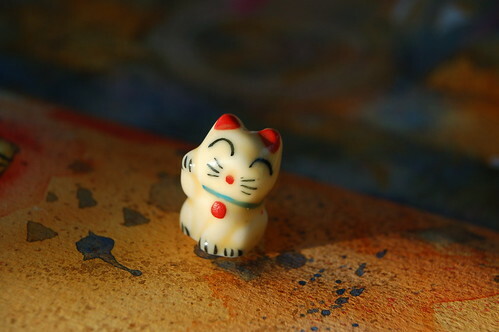 In Japanese restaurants they are very common and often mechanics move their little paw, though I have never seen one for sale before this tiny bead Neko. I hope he will bring me some luck. 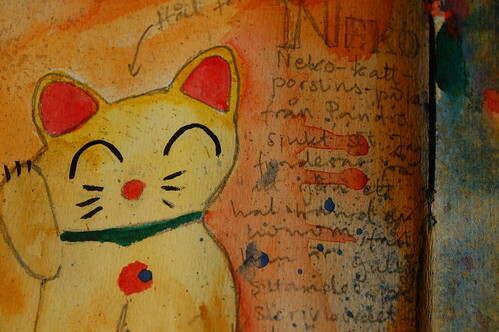 I did a quick little pen drawing of Maneki Neko and coloured it with my watercolours. I was thinking I was going to do lots of little drawings this summer, but there is so many things I want to do all the time. 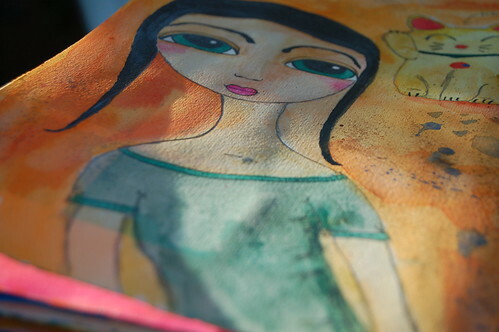 Yoga, drawing, collage, paint, sew, blog, write, laundry, meditation, Smilla-cuddle, drinks, cruising, bathing, sun worshiping and morning pages… Plus all the “musts” on my list. 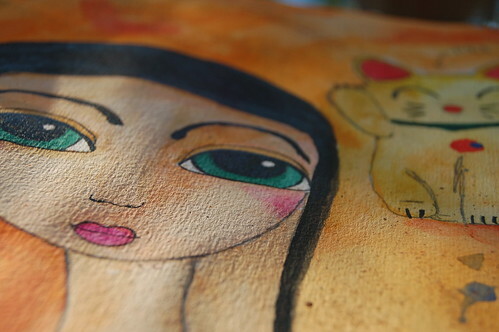 On my Neko page I also did a drawing of a iHanna-girl with black hair and big eyes. Just sipping my iced coffee in the shade, thinking of nothing special. And you? This entry was posted in A Creative Life, Art journaling, Draw & doodle and tagged drawing, Japan, kawaii, outdoor creating, still life, watercolours. Bookmark the permalink. Since I have stumbled upon your blog I can’t but help and visit it daily. I absolutely love visiting. I am so glad you post often. I just enjoy seeing what you are up too and what you are creating. I dabble in some crafts but wish I did it daily. Life is so busy right now. ooh i like the smilla-cuddling the best!! I do a lOT of jack-cuddling each day. I also have so many ideas and things “planned”, and then never do them!! Urrggghhh…like right now I have sitting next to me a book on drawing, a book on hand lettering, and a book on using the right side of your brain. Plus I need to learn InDesign because my vacation where I am going to make a book from is coming up in a week and a half, AND I am going to make a travel journal for that (inspired by YOU! ), and I have to fit laundry in there as well…and some sort of exercise. And work. Those watercolour backgrounds are yummy! I love the combination of ochre and blue. My summer is also filled with wants and musts. Ser rackarns bra ut, tycker jag! Du borde anv?nda ockra oftare, det blev snyggt, s?rskilt med det bl?! Och din iHanna-tjej ser ocks? bra ut! Jag har sett Neko-katter p? den japanska bokhandeln p? Tegn?rgatan i Stockholm, ta en kik n?sta g?ng du ?r i krokarna! Dom har en massa mat och godis ocks? (mums! ), och Hello Kitty-saker och manga, bland annat. Men jag gillade din lilla Maneki Neko, s? s?t! Jag gjorde klart mitt zine ig?r kv?ll, hoppas p? att kopiera v?ldigt snart s? att du f?r ditt ex! so much of my day is filled with cleaning, picking up, feeding, teaching my kids and house that I hope to fit in one creative thing for me each day… it doesn’t always happen but I feel so much better when I do. Thanks for the inspiration and reminder. these pages are so much fun with their lovely colors and delightful drawings. Just thinking about all the things I want to do at the same time, also. Even having a whole day off, sometimes it’s like I don’t catch up. I should be used to that feeling. I love the blue/green and ochre. Really nice.